The Wonderful 101 is packed with original superheroes, but the initial vision would have had players controlling an all-star cast of Nintendo's greatest. Platinum Games' recent Wii U exclusive The Wonderful 101 is a new IP with some snazzy character designs, but if the developers hadn't changed course the characters might have looked a lot more familiar. When Platinum Games originally pitched the idea for the game, the design document eschewed superheroes in favor of classic Nintendo characters, as well as popular icons from outside the Big N. The heroic aesthetic that the team eventually settled on never would have happened if it hadn't been for some tough executive decisions, and presumably a dizzying amount of licensing issues. 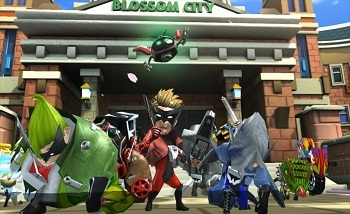 Hideki Kamiya, director of The Wonderful 101, says that the team's original vision was to "bring together world famous characters with Nintendo characters at its center, appearing all in one game." The goal would have looked something like the franchise-spanning cast of Super Smash Bros., had it gone unchanged. Kamiya hoped to "please everyone by letting them play the whole game as their favorite character." The idea was ambitious, but in the end it was too much. Even Iwata, who served as a producer on the original Smash Bros., was hesitant about the project. "The moment I saw the cover, I winced," added producer Hitoshi Yamagami. The game was rebuilt from the ground up as the original IP it is today. The Wonderful 101 launches September 15 in North America and is already on shelves in other territories.